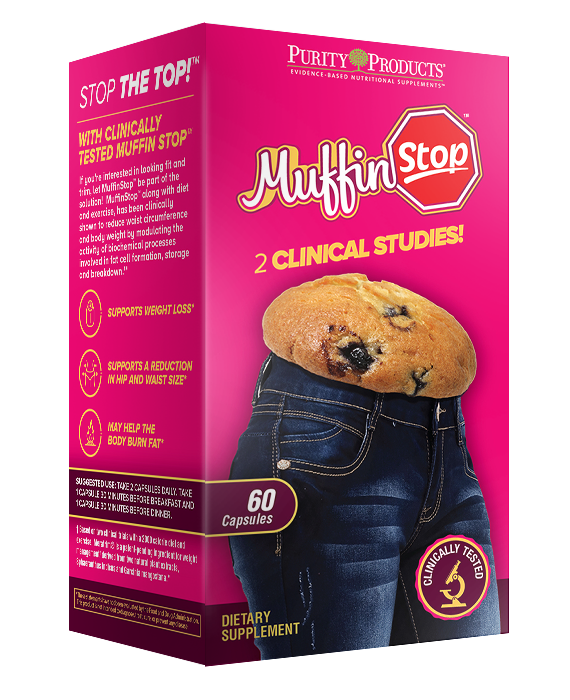 MuffinStop® - Stop the Top™! 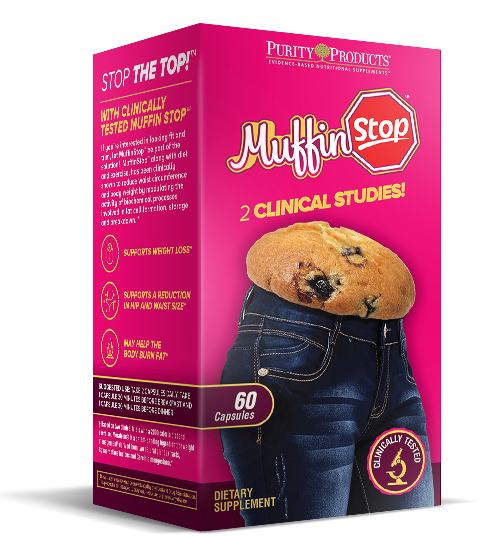 While the world waits for the elusive weight loss miracle pill, for now consider Purity’s new MuffinStop®. 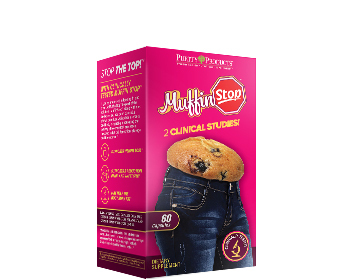 MuffinStop® was shown in two randomized, double-blind, placebo-controlled clinical studies to be an effective part of a responsible weight management program. MuffinStop® is a combination of two traditionally used botanical ingredients, Sphaeranthus indicus and Garcinia mangostana, now fused together to create one of the most innovative weight loss products the supplement industry has to offer. Research shows that MuffinStop® may start helping people reach their weight-management goals in as little as two weeks. The research also showed that participants receiving MuffinStop® instead of the placebo experienced interesting results in the hips and waist, two target areas where fat is often stored. Each of the two MuffinStop® clinical trials met the Gold Standard for research on human subjects by using the "double-blind, placebo-control" procedure. 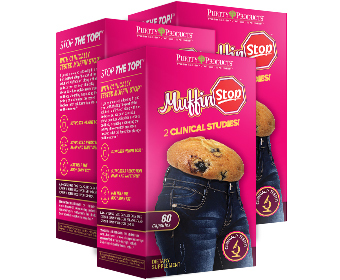 The results are convincing: MuffinStop® reduces body weight and waist and hip size better than diet and exercise alone. How does MuffinStop® work? It’s clinically-demonstrated ability to slim the stomach and hips may be due to its effect on the fat-burning hormone, adiponectin. Levels of adiponectin are known to correlate directly with the percentage of body fat. Studies shows that MuffinStop® increases adiponectin while also decreasing activity of several of the body’s key biomarkers involved in the creation, growth and storage of fat. These findings suggest MuffinStop® increases fat metabolism while simultaneously decreasing body fat accumulation. MuffinStop is a dietary supplement that contains a proprietary blend of two plant extracts. Sphaeranthus inducus flower heads and Garcinia mangostana fruit rind. This combination was shown in clinical research to reduce weight and waist size in two weeks and to reduce hip size in eight weeks. MuffinStop is not a miracle pill, but it does offer an effective option that can help you achieve reasonable weight management goals. Published double-blind, placebo-controlled research has demonstrated that the proprietary blend that comprises MuffinStop reduced body weight and waist and hip size better than diet and exercise alone. Research suggests MuffinStop can help burn fat. Preliminary data also demonstrates that it can reduce the expression of several key biomarkers involved in the creation, growth and storage of fat cells. 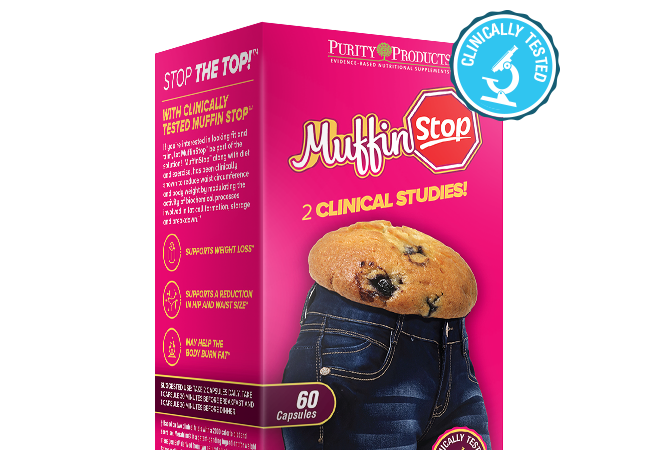 Muffinstop’s ability to burn fat, reduce fat storage, and reduce hip and waist size may be due to its ability to increase the fat-burning hormone, adiponectin. The research suggests you can enjoy weight loss and reduced waist size in as little as two weeks! Do I need to exercise or change my diet? Yes. The subjects in the two clinical studies consumed a diet of 2000 calories per day and walked 30 minutes, five days per week. It is unclear if one might expect the same results without following this protocol. † - $4.95 shipping applies. By accepting the free bottle offer (30-day supply) you will be enrolled in our Super Saver program, locking in the low Super Saver price of just $26.95 per bottle (27% off the retail price). As a Super Saver you will receive three bottles every 90 days - each bottle is a 1-month supply. Your first delivery of 3 bottles will arrive about 2-3 weeks after you receive your FREE bottle, so you don't have to worry about missing a day. Purity Products will charge the credit card used today for your 3 bottle shipments. Of course, you can customize your order at any time by changing the frequency, date of shipment and number of bottles shipped out to you. If you want to discontinue the automatic shipment, call us within the first 15 days and you will never even be billed.